A section of Bravo-6's exterior in 2558. HIGHCOM Facility Bravo-6, nicknamed the Hive, is the headquarters of the United Nations Space Command located in Sydney, Australia. The building is roughly conical in structure and is surrounded in security gates and other defenses. The entrance way features an atrium. Bravo-6's underground section is reinforced with massive blast plating, anti-EMP armor and three kilometers of solid rock. The UNSC Security Council convenes here. The High Command facility is also home to a War Games simulation facility where experimental technologies of the UNSC is tested, such as the M12 "Sword" Warthog LRV. Although Sydney was devastated during the Battle of Earth, Bravo-6 was not harmed. It continues to be the UNSC's headquarters in the post-war era. A meeting of UNSC officers at Bravo-6. During the Insurrection, Bravo-6 was used by the UNSC to monitor dissident colonies. High-ranking UNSC officials used the Wendy House of Bravo-6's Threat Analysis Wing to stage war games and run tabletop exercises. Such rooms were later left abandoned as the emergence the Covenant War took precedence over inter-human violence. On September 4, 2552, following the Fall of Reach, a debriefing was held at Bravo-6 for Lieutenant Wagner in front of the Security Council. Wagner informed the Security Council of the planet's glassing and the UNSC Pillar of Autumn's escape. Bravo-6 was left unscathed during the Covenant's assault of Earth and continued to serve as the UNSC's primary headquarters. In January 2553, a meeting of high-level UNSC officials was held by Commander Musa-096. He discussed the development and necessity of the new SPARTAN-IV program. Musa informed the council that the Spartans would have their own independent branch within the UNSC. On January 26, 2553, shock troopers Malcolm Geffen and Vasily Beloi arrived at Bravo-6 and met with Sergeant Lian Devereaux, Spartan Naomi-010, Captain Serin Osman, Professor Evan Phillips, and CINCONI Admiral Margaret O. Parangosky. They were assembled into a black operations team known as Kilo-Five. After they were recovered by Kilo-Five, Dr. Catherine Halsey and the other survivors from Shield World 006 were taken to Earth to be debriefed at Bravo-6. In March of 2555, following Luther Mann and Henry Lamb's discovery of a suspicious Halo array firing countdown on Installation 07, an emergency conference between military representatives and scientists was held inside Serin Osman's office at Bravo-6. The attendees at the meeting, comprised of Serin Osman, Dr. William Iqbal, Dr. Bob Casper, Captain Annabelle Richards, Admiral Terrence Hood, General Crystal Speakman and General Van Zandt, decided to reactivate the Portal in Voi to send a joint Human-Sangheili expedition to the Ark in order to stop the activation of the array. On March 3, 2558, Captain Thomas Lasky and Spartan Sarah Palmer were requested to appear before the Security Council at Bravo-6. The Council expressed misgivings about Lasky's handling of the Requiem Campaign. In late October of 2558, Cortana, who had been restored within the Forerunner Domain and had come to believe that the Created were the true inheritors of the Mantle of Responsibility, began to unleash Guardians to enforce the Mantle among all the galaxy's species. Having anticipated her imminent assault on Earth, Black-Box acted swiftly to secure the military AIs at Bravo-6 before they could join the Created, and help evacuate Admiral Osman and Lord Hood off-world. Using the shell personality of a "Spartan Commander Rossbach", he had a briefcase containing the AIs delivered to Osman and had Spartan Orzel ready to take the Admirals to safety. 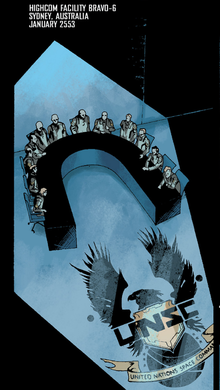 While Cortana's message of galactic unity under the Created was heard throughout the facility, Osman and Lord Hood grabbed an elevator to the top of the HIGHCOM tower, where Orzel quickly hustled them into a Prowler. As their Prowler escaped safely to Rossbach's World, a Guardian appeared and disabled many Broadswords and the UNSC Plateau over Sydney. The fate of Bravo-6 was left unknown; if the Plateau's engine core detonated upon impact, the facility would have been likely destroyed. The historic painting "Washington Crossing the Delaware" is located in Bravo-6. Another painting, "Admiral Cole's Last Stand", is also on display in the facility.